The applet The Moving Man enables students to experiment and learn about motion, position, velocity and acceleration. The movements of the man are plotted in charts. Move the little man back and forth with the mouse and plot his motion. Set the position, velocity, and/or acceleration and let the simulation move the man for you. 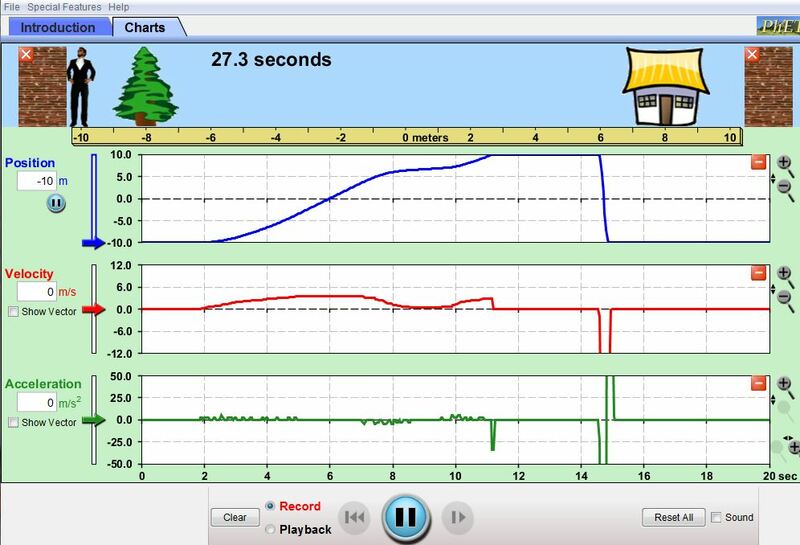 Interpret, predict charts/graphs on position, velocity and acceleration. Describe, make sense of and reason about the charts. If you register at the PHET website as a teacher, you have access to the information for teachers. The website offers examples of worksheets and questions for students at different levels. Students can make a graph that fits a story, or make a story that fits a chart. At primary school level focus on one chart in the beginning. For example: What is the story behind this chart? Do not underestimate the complexity of only the first chart. It shows a timeline, the position, negative numbers, and a man who covers a distance. Pattern problems are a relatively new phenomenon in mathematics education. They can be used both for early algebra in primary school as well as in secondary school. At primary level students reason and come up with a description of how the figure or pattern grows using word formulas. At secondary school level, students can be encouraged to describe the formula for the nth pattern using symbols for the variables. Introduce a pattern to the class and ask them to look at it first. Then ask them: How do you see the pattern grow? 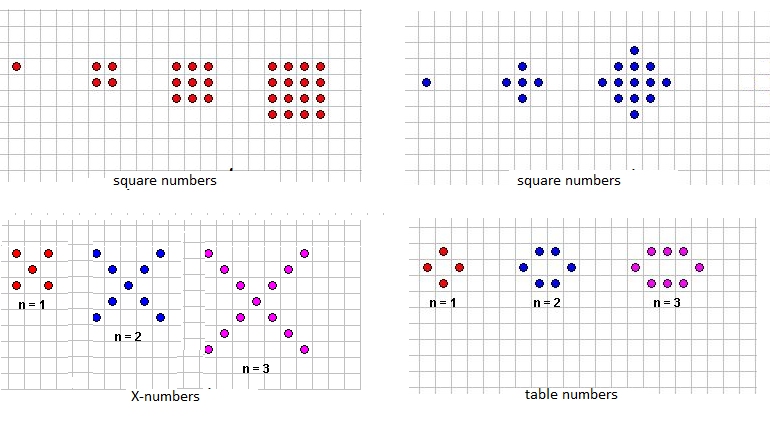 For the example below we have used the applet Spotting Numbers and coloured in blue the different views students could have on how the pattern grows. With how many dots does the figure grow? What about the 20th or 50th figure? How many dots are required? How many dots are on the base? Can you describe a ‘rule’ for the growth? Can you describe a formula for finding the nth figure? Information on the applets: Spotting numbers and Spotting number problems. Algebra is not about learning to write in symbols (although they become useful later), algebra is about generalisations and patterns. 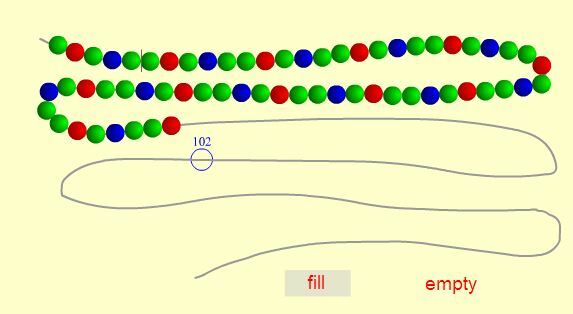 Beads on a string is a game that one can solve with trial and error, but it is more efficient to find patterns and rules. The ten tasks offer children plenty of opportunities to think, explore, reason and discover the pattern or rule. The applet is developed by the Freudenthal Insitute, University of Utrecht (NL). For more maths applets from the Freudenthal Institute see Rekenweb (grade 1-7) or Wisweb (grade 7-10). The applet Beads on a string can be used with children in the age of 8-12. You may want to add a few questions in between step 2 and 3. If you have real beads in five colours and a string, the questions you and the students can ask are endless. Gears is an applet that offers short tasks based on gears. The game applies knowledge, skills and concpets from both maths and engineering/mechanics. The applet Gears can be found at two different locations in the Primas project and on the RekenWeb. The applet can be used in grade 4-8. 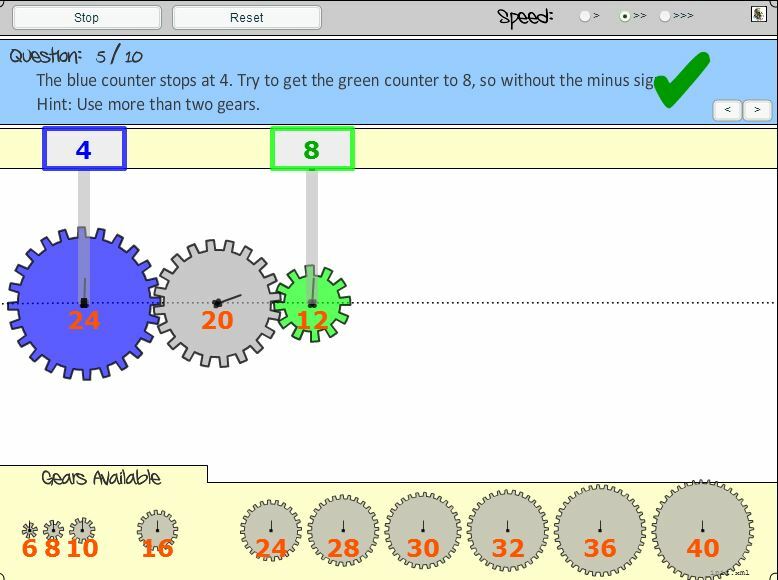 We used the applet as preparation for more complex tasks using GearSketch. Note: The applet does not work on an iPad. Wisweb offers interactive Math Applets. There is a whole set available, but some have some technical problems. The applets ‘Building Houses’, og ‘Building with Blocks’ work very well. Students learn to build 3D buildings from information about the ‘side views’ and the ‘top view’. The applets er so visual, that the feedback is inherently given to the students. Below a few screenshots, but we recommend that you try the applets online.